The Lads set up web sites with more or less sophistication which mimic those of real banks, or create 'identities' for banks which don't exist. Examples sent by Kindly Contributors appear below, most recent ones first. The Financial Times (3/3/2003) described actual penetration of banks by scammers as staff. new scammers use this fake Bank of Africa website (supposedly in Cote d'Ivoire) to impress the marks. The 2 phone numbers given are both cellphone numbers. According to RIPE (www.ripe.net), 195.110.124.144 is currently assigned to dada.it/dada.net in Firenze, Italy. The copyright notice reads " © All rigth Reserved to Bank Of Africa"
"PUBLIC NOTICE We have found out that some people always try to use our site or bank name to scam the public. You are therefore advised to contact the bank through any of the e-mail address on the contact page for confirmation. [which of course would be, uh, the scammers] You are also warned not to comply or respond to any e-mail that did not pass through any of our e-mail addresses on the site." "What we do - LEEDS. helps people open bank accounts. Opening a bank account in United kingdom can be confusing and extremely time consuming unless you know intimately the United kingdom banks, their policies and procedures. We cut through the red tape to get you the United kingdom bank account you need. " Does this sound like a legitimate English bank? Didn't they, like, invent English grammar and stuff? They appear to have lifted a lot of content from a real bank. 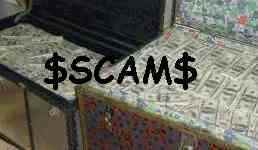 The Kindly Contributor says that someone is known to have been majorly scammed by this "bank". Looks pretty similar, right? Even if the structure is slightly diffferent, they have copied the text of e.g. the products and services and other things they needed to make the fake bank look credible. First-Rand is used for the lottery scam EURO-AFRO-AMERICA SWEEPSTAKE LOTTERY, featuring "Dr Jim Parsons" as the lottery director. Sprint Securities BV claims to be a finance and security firm registered by the RvA, Dutch Council for Accreditation. They say they are in the business of handling finances for lotto contests among other things. The RvA says it has no relation with Sprint Securities and considers them a fake. ( www.rva.nl/uk/rfouteclaimuk.html ). Some of the remarks made in this forum were apparently taken to heart by the scammers, as the web site has been slightly changed. Still, beware! Thank you very much for your prompt response to my mail. information you require is in it. I will wait for your response as a matter of urgency. director of finance of the Federal Ministry Of Power & Steel (FMP&S). transformers for the south-western part of the country. off, leaving the balance USD23.2M. you fully, and discuss your renumeration for this undertaking. It used to be redirected to a student account at Utrecht School of the Arts - so I e-mailed the school to suspend the account. It did get suspended but it just got transferred to planet.nl (Planet Internet). Well, the work of an anti- scammer never stops, huh? to make this whole transaction come to sucessful end. with out delay. Bless You. public who transact business with these persons do so at their own risk. Prudence should be exercised when dealing with these persons. " Heres one I haven't seen before. They even set me up with a nice online bank account just full of money. TRANSFER FILE WITH YOUR NAME  AS BENEFICIARY. OF NIGERIA, AND I THEREFORE DECIDED TO MOVE CAUTIOUSLY. LAST MONTH, I FOUND THE SOLUTION! OF YOUR CHOICE ANYWHERE IN THE WORLD! YOU TO BEGIN WIRING OUT YOUR MONEY! UNBELIEVABLE? I am now ready to give you the A/C access information. to my personal  Bank A/C below. Keep up the good work. I hope to contribute more soon. it appears they are using this to pretend there is millions in an account in your name, then they ask you to put your bank info so they can 'transfer' it to you. It's actually the most sophisticated 419 site I've ever seen, especially compared to the Eurolite one which was quite amateurish. I read your "Big Mac" series of emails a couple of days ago after hearing more and more about 419 fraud. It was probably one of the funniest email correspondences I've read. I thought you'd be interested to read the following story on BBC News, it was also on the radio this morning too. Keep up the sterling reportage. The link is titled "Fake bank website cons victims" and described how West African criminals have used a fake version of a real British bank's online service to rob people. Says the Kindly Contributr: WARNING ! ! ! They Web sites are very good ! "... The site is (www.xxxxxx.com)I believe that this is a good news for us to credit this US$18m into your online account with my bank, then you will transfer immediately from your online account with my bank to your private account for our mutual benefit. On this note, I advice you to that and send your Online account to me for my Lawyer to arrenge the Legal documents that proofs you the next of kin to this fund. My regards to your family." SCAM-O-NOTE: The bank in question apparently is a REAL bank, and requested the removal of its name from this list. This may be where the Lad was banking, which is not the same as the bank being a scam. After all, crooks have to bank somewhere. Scamorama did not mean to imply that this bank was disreputable. The mistake was one of context. Anyway it's all XXXed out. I also came across Kapital in my encounters with Kima Savimbi. and the site came up. sending to my account in AMsouth Bank Mississippi. this hyar tansactiun. Does you think he is acceptable? We are in receipt of your e-mail dated 19-11-2002.
the  subject matter. He is very good and reliable. That means they are either fake or I am really getting the money! fess will be deducted before the sharing of the fung" - end of quote). 232 Manute Avenue V/Island Lagos. My name is Barrister ADAMU IBRAHIM, Attorney at Law and Legal advisor to Mr.
in Lagos state after take off. account will be dormant & closed for inactiveness within the last two year. Which seems to be owned by Dialtone Internet. regarding this bank. You can see it here. An amusing exchange with the fraudsters can be seen here. The mention of the bank is about halfway down. From Comrade Alexander Kerensky (see Funny Links on this web site). to "login" to a tracking website using a so called "tracking number"
to find out where the luggage contain the millions of dollars are. on the tracking number entered. fell for it first back in May. I wonder exactly how many of those 25 have sent money to the lads. which from a bit of Googling seems to be a real bank in Nigeria. This is the fake site. and got the following reply. quide you open an online account with our bank. enable us create the account in your name. accounts just yet. At this stage I am just making general inquiries. to export from there. I am looking closely at that possibility though. The "Bank" didn't want to know. thanks once more for showing interest in our bank. But it says on your web site that you do exactly what I need. I need to talk to a manager not a flunkey. the services you required at the moment. I am not mad at you Ossy. Get your superiors to mail me directly. I wish to comunicate with them. Don't worry it is not about you. Hello (ISP guys - who never answered). wesite. It would be this one. whois  lookup indicates belongs to (you) and gives your e-mail addresses. Now I belive that the All States Trust Bank is a real bank and is "probably"
located at the address below. I also think they have other branches in Nigeria. ideas on this "bank" here. will list below (with headers) and forward to you properly after this mail. Next I insert a reply to a mail of mine from the friend mentioned above. Nah, I don't think the banks legit. When you go to the 'contact us' section they ask far too many questions. A contact should only need to give their email for a reply. at @opera.com, the second was the Ossy you contacted. The new account form is very 'iffy' and they never ask for a signature! They are just getting smarter but not too smart. the weekend and that I don't have e-mail at home. enable  us create the account in your name. the Belfast Police, Crime Stoppers (Belfast) and Scotland yard. by Dr Oscar Duru without my knoledge. Guinea where we are working on off shore oilfields, both facts being correct). "Our records indicate that your fund transfers have been stopped. Please contact oour Agent Mr. Carl Smith for remedial advice. me again in the middle of a meeting I tell him this.Then I get this funny email. and fax numbers for my records. again?He must have seen our letterhead there.But I play the game. contact oour Agent Mr. Carl Smith for remedial advice. > Since you live in London, why not contact this Agent in London? > What are you talking about the email? Low and behold I am given an email address for Carl Smith. INFORMATIONS YOU NEED TO ACCESS AND TRANSFER YOUR FUND WITH OUT PROBLEMS. Mr Abu Baker is keen to help me out for handling his affairs here.